Sudden cardiac death (SCD) is the leading cause of death in adults worldwide. Coronary heart disease is the underlying reason for most of the patients with SCD, including acute coronary syndrome and chronic ischemic heart disease. Revascularization is an important treatment technology for coronary heart disease, which includes percutaneous coronary intervention and surgical coronary artery bypass grafting. However, according to the recommended guidelines, even with the use of secondary prevention strategies such as medication treatment and a complete revascularization, there are still a great number of patients who have reduced left ventricular ejection fraction, heart failure, and ventricular arrhythmia at different stages in the course of disease. SCD remains to be a serious challenge in the long-term management of ischemic heart disease patients who have had revascularization. Here, we focus on broader issues of concerns to provide more insights by comprehensive recommendations for the clinical treatment of coronary artery disease after revascularization for SCD prevention. Sudden cardiac death (SCD), according to the definition by the World Health Organization, is defined as the accidental death that occurred within 1 h after the onset of symptoms which was usually due to cardiac causes. SCD was the leading cause of death in adults worldwide, and the incidence is 41.8/100,000 in China, wherein 540,000 people die each year. Sudden cardiac arrest (SCA) is a fatal event which occurs due to the circulatory failure by the sudden stopping of the heartbeat. There were over 320,000 people who suffered from SCA each year in America with a morbidity of 103/100,000, and the average age was 66, while the survival rate was 5.6%. Coronary heart disease was the underlying reason for most of the patients with SCD, including acute coronary syndrome (ACS) and chronic ischemic heart disease. There has been a declining trend in the mortality rate of coronary artery disease due to the active promotion and implementation of the primary and secondary prevention strategies, as well as the modern treatment of coronary heart disease, especially extensive development of percutaneous coronary intervention (PCI) in the early stage of acute myocardial infarction (AMI). However, the incidence of SCD does not decrease and inflicts 76/100,000 annually, which is still ranked first place in the fatality rate of US male patients when compared with the deaths caused by lung cancer, prostate cancer, colorectal cancer, cerebrovascular disease, diabetes, and lower respiratory tract infections. SCD was also the leading cause of death in women, which was 1.7 times more (45/100,000) than the breast cancer mortality. There was a significant drop in the ACS hospitalization and recent mortality rates due to the developments in treatment technology, but there were a total of 16%–25% of patients who were suffering from heart failure within 1 year. This was an important reason for the rising prevalence of heart failure over the past 10 years. Coronary artery disease was the cause of disease in two-third of patients with systolic heart failure. The risk of SCD for the patients with heart failure was significantly higher than the patients with other heart diseases. A population-based study showed that the incidence of SCD with a history of myocardial failure was the highest compared with other patients with heart diseases, which was 3.65 times of the whole group of patients with heart disease. Revascularization is an important treatment technology for coronary heart disease, which also includes PCI and surgical coronary artery bypass grafting (CABG). Revascularization alleviates the symptom of myocardial ischemia, and also reduces the mortality and improve long-term prognosis. However, according to the recommended guidelines, even with the use of secondary prevention strategies such as medication treatment and a complete revascularization, there are still a great number of patients who have reduced left ventricular ejection fraction (LVEF), heart failure, and ventricular arrhythmia at different stages in the course of disease. SCD still becomes the main cause of death in such patients and constitutes for one-third of all other deaths in the patients who have received CABG complete revascularization. This is also supported by a clinical study (STICH trial) where patients with ischemic heart disease combined with heart failure underwent CABG treatment. Therefore, SCD remains to be a serious challenge in the long-term management of ischemic heart disease patients who have had revascularization. Hence, in this article, broader issues of concerns are focused, which provides more insights by comprehensive recommendations for the clinical treatment of coronary artery disease after revascularization for SCD prevention. SCD prevention strategies: According to the clinical guidelines, there are primary and secondary prevention strategies for treating SCD in people with ischemic heart disease based on their clinical features and laboratory indicators and based on a large number of published clinical trials. Secondary prevention refers to the prevention of SCD in patients who have survived a prior SCA or sustained ventricular tachycardia (VT). There is a high risk of recurrence of SCA or VT for such patients. A long-term follow-up of SCA survivors and sustained VT patients showed that: the incidence of 1-year, 3-year, and 5-year VT or ventricular fibrillation (VF) was 19%, 33%, and 43%, respectively. Anti-arrhythmic drugs were essential for secondary prevention of SCD, besides medical therapy of coronary artery disease and revascularization in the ages before the application of the implantable cardioverter defibrillator (ICD). Amiodarone and β-blockers can reduce the occurrence of VT and VF but showed limited effectiveness. ICD is currently the first-line therapy recommended in the secondary prevention of SCD. Meta-analysis of three randomized trials of SCD secondary prevention (AVID, CASH, and CIDS) showed that the risk of arrhythmic death was reduced by 50% in the ICD group, and the risk of all-cause mortality was reduced by 28%. Revascularization cannot effectively prevent the recurrence of VT for sustained monomorphic VT patients with a history of myocardial infarction. In addition, blood electrolyte abnormalities are common in SCA survivors. If there are no correctable risk factors in SCA survivors, ICD implant is recommended for these patients as the secondary prevention. The main limitation of the secondary prevention strategy was that most of the SCA patients who never experience SCA before cannot survive and thereby lose the opportunity of prevention. According to the statistics released by AHA in 2015, there were 326,200 people suffering from SCA outside the hospital in America. It accounted for the survival rate of only 5.6% and finally discharged patients who received cardiopulmonary resuscitation and other rescue measures, even in a country like America which includes better SCA emergency systems outside the hospitals and a common artificial cardiopulmonary resuscitation. These data indicate that the secondary prevention is quite late for most of the patients who have a potential risk for SCA. The primary prevention is illustrated under this background. Primary prevention of SCD refers to the use of ICDs in individuals who are at risk but in those patients who do not yet have an episode of sustained VT, VF, or resuscitated cardiac arrest. ICD has been shown to decrease all-cause mortality of SCD and improve the long-term prognosis based on the optimal drug therapy and revascularization for coronary revascularization. SCD is mainly caused by life-threatening ventricular arrhythmias (VF or VT). These serious arrhythmias are considered to change the ion channels of the myocardial cell and intercellular electrical conduction features that are caused by the scar of ischemic myocardium and myocardial infarction, cardiac remodeling, and heart failure. These ventricular arrhythmias result in the SCD by triggering factors such as increased sympathetic tone, hemodynamic deterioration, blood electrolyte concentration, and PH changes.,,,, Factors such as environment and time period also affect SCD, which is a very complex and dynamic process. It is hard to accurately predict when SCD occurs or as to how a particular patient could suffer from SCD, but risk stratification has been performed according to the existing clinical results, thereby determining the level of risk for SCD. Prevention of SCD requires immediate action according to the level of risk. Currently, the following four methods and indicators for SCD risk stratification for the patients with ischemia heart disease were present: (1) the method of anatomy matrix to detect the presence of ventricular arrhythmia, (2) the indicators of changes of ventricular electrophysiological properties, (3) the indicators of autonomic nervous system dysfunction, and (4) other methods and indicators [Table 1]. Myocardial scarring and the alteration of anatomical structures are the prerequisites for the generation of ventricular arrhythmias. Myocardial scar and its surrounding areas may have slow electrical conduction and increase conductive characteristics, which forms the basis of VT/VF generation. 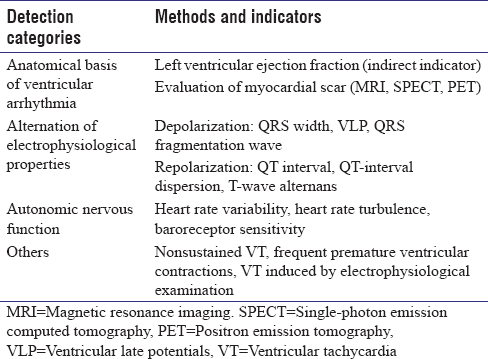 The degree of reduced LVEF can roughly reflect the size and scar burden of the left ventricle in patients with coronary artery disease after myocardial infarction, which is currently the most crucial indicator in predicting the SCD risk., Cardiac imaging examination can be used to evaluate the size and anatomical features of myocardial scar, including echocardiography, ultrasonic tissue Doppler imaging, single photon emission computed tomography (SPECT), and positron emission tomography (PET)., Cardiac magnetic resonance imaging (MRI) helps in examining myocardial fibrosis and scars through delayed imaging enhancement, and the spatial resolution is better than that of SPECT and PET, as this is not affected by blood perfusion. Myocardial scar burden was measured by MRI which showed good predictive value for SCD and is widely used in the current clinical studies., Further clinical studies are required to verify the imaging techniques that mediate the detection of myocardial scars to determine the predictive value of SCD. Due to these limitations, such as resolution, reproducibility, and other factors such as high cost and time consumption, the measurements of myocardial scar burden are not used as common methods for determining risk stratification of SCD in the current clinical practice. DETERMINE trial was aimed to evaluate the predictive value of MRI on SCD by observing the appropriate therapy rate of ICD in patients whose left ventricular scar was >10%, but due to the difficulty in the patient selection, the trial was stopped prematurely. LVEF has been known to predict the risk of SCD, though has limitations, but so far, significant reduction of LVEF (<30%–40%) acts as the main indicator for selected patients in the clinical trials who used ICD as the primary prevention of SCD. The results of these clinical trials confirmed that ICD can effectively prevent SCD in patients with ischemic or nonischemic heart disease and significant left ventricular dysfunction (reduced LVEF)., Moreover, it has been further illustrated that LVEF can predict the risk of SCD; therefore, it acts as an important indicator of risk stratification. However, other factors of risk stratification are listed in [Table 1], but these factors were not similar to LVEF which was confirmed in the clinical trials of SCD primary prevention.,, Therefore, LVEF still remains as an important indicator of risk stratification for SCD when the current clinical guidelines involve the primary prevention of SCD, for both ischemic heart disease and nonischemic heart disease. The direction of future efforts should include research by combining other indicators, including the indicators listed in [Table 1] and some biochemical indicators (such as B-type natriuretic peptide and C-reactive protein) and genetic detection,, to compose a risk stratification system based on LVEF to overcome the limitations of LVEF as the only indicator. According to the ICD registration material from the National Cardiovascular Disease Data Registration (NCDR), there were 139,991 cases of patients with ICD implantation in 1435 hospitals of America in 2011, and the primary prevention of SCD was conducted for 106,131 cases, accounting for 75.8%. PCI registration materials (Cath PCI Registry) from NCDR showed that there were 632,557 cases performed with PCI in 1337 hospitals of America in 2011, with the proportion of PCI cases to ICD cases of 4.5:1. According to the data published by the European Heart Rhythm Society in 2014, there were 36,100 cases with ICD implantation and cardiac resynchronization therapy pacemaker with defibrillator (CRTD) in Germany, and the implantation population ratio was 445/million. Furthermore, the implantation population ratio was 369/million, 118/million, and 17.6/million in Italy, Spain, and Russia, respectively. In 1992, the first epicardial ICD was implanted by surgical operation in China and the first operation of ICD was implanted transvenously in 1996. There was a greater increase each year after 2001. However, up to 2013, there were only 3068 cases of annual ICD and CRTD implantations in China, with the implantation population ratio of 2.3 per million, which was significantly less than that in Russia. In 2013, a total of 404,505 cases of PCI were performed in China, with the ratio of PCI cases to ICD and CRTD cases of 148:1, which was 32.9 times higher than the ratio in America. Taken together, it indicates that China has a big gap with foreign countries for the prevention of SCD using ICD and also receives much less attention toward the prevention of SCD post-PCI operation for the coronary heart disease patients. To change this situation, the national health insurance reimbursement for ICD should be improved, while the common knowledge of the prevention of SCD among doctors and patients should be widespread. The risk of SCD is still high for some patients with coronary heart disease after revascularization (for instance, LVEF ≤35%), but the prevention of SCD is neglected for the patients who have received revascularization therapy that is considered for the cause of disease. Cost-effectiveness analysis of ICD in the primary prevention of SCD abroad showed that the consumed resources increased 1-year survival which was similar to the renal dialysis (renal dialysis was $30000–50000 and ICD was $25300–50700)., The cost-effectiveness can be improved if patients with severe ventricular arrhythmias and high risk of SCAs were selected, but with low risk of death due to other causes. The increase of other risk factors in the risk stratification of SCD may achieve this goal besides significant LV dysfunction. Revascularization is the most important therapeutic measure for ischemia associated with ventricular arrhythmias. From this perspective, revascularization has a great significance in the prevention of ischemic heart disease of SCD. Ischemia-associated severe ventricular arrhythmias and SCA are the most common in ST-segment elevation myocardial infarction (STEMI) in 48 h after the onset. It is also common in the non-ST-segment elevation with ACS (NST-ACS) as well as in chronic ischemic heart disease. For patients with chronic stable ischemic heart disease combined with heart failure and patients with chronic myocardial infarction, the occurrence of arrhythmias is mainly due to the alteration of cardiac electrophysiological properties, which forms the substrate for generating and maintenance of the ventricular arrhythmias based on cardiac scar and fibrosis and occurrence of severe ventricular arrhythmias and SCA under the action of trigger factors., Therefore, revascularization alone cannot effectively prevent SCA caused by arrhythmias.,, After revascularization, according to the different status of patients, the risk of SCD should be evaluated and comprehensive treatment measures including ICD implantation should be adopted to prevent SCD in the indicated patients. VT/VF within 48 h of onset of STEMI is terminated by acute electric events, which is related to the onset of myocardial ischemia. To prevent VT/VF at the early stage of STEMI, it is important to carry out PCI as early as possible, optimize reperfusion therapy of myocardial ischemia, correct electrolyte imbalances, prescribe β-blockers, and take measures to prevent ischemic stress and the resulted heart failure and cardiogenic shock. PCI is the most critical element in the series of treatments. Moreover, direct PCI can reduce the risk of ventricular arrhythmias and SCD in STEMI patients. A registered research led by two centers of Germany and Finland showed that the incidence of SCD was quite low if the patients with AMI had received revascularization (direct PCI or CABG), combined with the treatment of β-blockers, aspirin, statins, and angiotensin-converting enzyme inhibitors (ACEI). Only 1.2% of cases had SCD in the 2.9 years of follow-up. The incidence of SCD was 3.6% if the patients had received the above treatments partially. The risk of SCD for the patients without revascularization was 2.1 times the risk of patients with revascularization. Moreover, the time of reperfusion therapy (the time from the occurrence of the symptoms of myocardial infarction to the open of infarct-related artery) was found to be associated with induced VT and the occurrence of sudden death in future and severe ventricular arrhythmias. This study enrolled patients received primary PCI and with the LVEF ≤40%. The primary end-point was whether VT can be induced by electrophysiological examination after 3 days of myocardial infarction. The secondary end-point was the sudden death or severe ventricular arrhythmias after 2 years of follow-up (ICD treatment was needed). It was found that the shorter the time of reperfusion (it was divided into ≤3 h group, 3–5 h group, and >5 h group), the less the occurrence of primary and the secondary end-point events. Therefore, patients with STEMI should be conducted with primary PCI as early as possible, and it is very important to shorten the time of reperfusion therapy in the prevention of future SCD. For patients with STEMI, direct PCI can reverse the structural abnormalities of the left ventricle, and improve the left ventricular function. The risk of SCD may reduce with the recovery of left ventricular function. Observation of the dynamic alteration of left ventricular remodeling by consecutive echocardiography after direct PCI showed that 39% of patients achieved the criteria for the reversal of left ventricular remodeling after 6 months, which means that the reduction of the left ventricular end-systolic volume was >10% of the basic value. However, most patients cannot achieve this standard. Another study compared the alteration of 5-day and 4-month left ventricular function and remodeling indexes after direct PCI. The magnetic resonance was used to measure LVEF, left ventricular end-systolic and end-diastolic volume index. It was found that for the patients with LVEF basic value <50%, if troponin I was significantly increased, LVEF and left ventricular remodeling index cannot be improved or deteriorated and left ventricular volume index was increased in 4 months after PCI. The risk of SCD is significantly increased in patients with myocardial infarction combined with heart failure. Primary PCI can significantly reduce the in-hospital mortality of the patients with STEMI, leading to most patients with large areas of myocardial infarction or severely diseased patients with myocardial infarction can survive to discharge from the hospital, but there is a risk of heart failure in the future for these patients. Therefore, the in-hospital mortality of patients with STEMI have been significantly reduced with the popularization and promotion of the early and optimal treatment with direct PCI as a key strategy, but the incidence of heart failure for these patients was increased. A retrospective study showed that 1-year cumulative incidence of heart failure was 23.4% in over 9000 cases of STEMI patients, and the newly emerged heart failure within 1 year after discharge was 12%. The study suggested that >1/5 of STEMI patients had higher risk of SCD after discharge. The CADILLAC study showed that after direct PCI, LVEF ≤40% was the most important predictive factor for 30-day and 1-year mortality. SCD is still the main reason of death for STEMI patients who discharged after direct PCI, even if standard secondary prevention of coronary heart disease is applied. A recent study analyzed the short- and long-term causes of death in over 2800 STEMI patients, with an average follow-up of 4.7 years. In all 717 cases, the causes of death, the top was cardiogenic shock (140 cases, 19.5%), which occurred at 0–3 days in the course of the acute phase; which was followed by tumor occurrence (124 cases, 17.3%) at 3.25 years (1.96–4.63 years); the third was SCD (111 cases, 15.5%) standing on 2.75 years (1.28–3.00 years); myocardial re-infarction was the fifth cause of death (45 cases, 6.3%), which occurred at 227 days in the course of disease (6–1096 days); and heart failure was the sixth one (29 cases, 4%), which occurred at 717 days in the course of disease (50–1237 days). The results of this study demonstrate that SCD is the fifth cause of death in the long-term cardiac death for the discharged patients after direct PCI, with the incidence of SCD which is markedly more than the total incidence of all other cardiac deaths, and it is 2.47 times the death of myocardial reinfarction. Therefore, the prevention of SCD is based on the treatment of cardiac ischemic events, such as the prevention of myocardial reinfarction which, should be paid more attention in the long-term management of patients discharged after direct PCI. CABG can decrease the risk of severe ventricular arrhythmias and SCD for patients with preserved or mid-range left ventricular function. However, it could only partially prevent SCD, and the effect was largely limited for patients with significant abnormal left ventricular function. A registered Japanese study compared the impact of PCI and CABG on the prognosis of patients with three-vessel and/or left main branch lesions. After 4.7 years of follow-up, if the LVEF ≤50%, sudden death after PCI operation accounted for 32.1% of the cardiac death, while sudden death after CABG accounted for 28.3% of the cardiac death, indicating that sudden death still remains the reason for cardiac death. The STICH study with 1212 cases of ischemic heart failure patients who were suitable for CABG operation and LVEF ≤35% were enrolled and the patients were randomly divided into CABG operation group and the medical therapy group. There were a total of 462 cases of death after 56 months of follow-up, with the total mortality of 38.1%. A total of 351 cases died from cardiovascular diseases, accounting for 76% of the total deaths. Sudden death was the main cause of death in cardiovascular disease-mediated deaths. Seventy-four cases in the CABG group were subjected to sudden death, accounting for 33.9% of cardiovascular deaths; 99 cases in the medical therapy group were subjected to sudden death, accounting for 40.6% of cardiovascular deaths. Revascularization should be considered for patients with heart failure combined with ischemic heart disease, silent angina, or viable ischemic myocardium. However, it was of limited benefit for patients with severe heart failure (LVEF ≤35%), and then CABG was recommended by the guidelines. In the substudy of MADIT-II trial, the association of the course of disease with ventricular arrhythmia after revascularization was observed. In the eight-year long-term follow-up, the longer the time of revascularization, the higher the risk of severe ventricular arrhythmia (ICD treatment was needed), and the risk could increase up to 6% for each additional year. Thus, in the long-term management of the patients after revascularization, the on-going prevention of SCD should be noted. Thirty-day mortality had significantly reduced hospitalization of STEMI patients due to extensive development of PCI. The early-stage mortality was also significantly reduced in patients with NSTEMI who received various therapeutic strategies including revascularization in terms of risk stratification according to the guidelines. However, the long-term mortality and event rates after AMI were underestimated and the 6-month mortality rate was still as high as 12%., SCD was the main or the leading cause of death in all the cases of deaths, even if revascularization was completed it accounted for 24%–40% of the total deaths., There were a total of 720,000 cases of new or recurrent myocardial infarction in America and 200,000 cases which belonged to high-risk SCD patients who needed active prevention. The high incidence of SCD in the early stage after AMI (within 30–40 days) resulted in high-risk of sudden death. However, more than half of the SCDs were not caused by arrhythmias, but by reinfarction or mechanical complications that were due to left ventricular rupture and acute mitral regurgitation. In DINAMIT study, only 50% of SCDs were attributed to arrhythmia, while the rest were due to the mechanical complications of the heart. In the VALIANT trial, according to the reported data of 105 cases of the autopsy, 80% of the causes of SCD were reinfarction or cardiac rupture in the 1st month after the onset of AMI, and only 20% were speculated to be caused by arrhythmia. The combined data from the four ACS studies showed that approximately one-third cardiovascular deaths after NSTE ACS were caused by SCD. Accurate risk stratification can be performed by collecting the information of clinical variables of LVEF, age, diabetes, assessment of glomerular filtration rate, heart rate, myocardial infarction, peripheral vascular disease, ancestry, gender, and Killip classification. Thus, there was no benefit for the early implantation (within 40 days) of ICD after AMI, in patients caused by nonarrhythmia which accounted for the most in the early stage of SCD. Although the arrhythmic death can be reduced, there was no improvement in the overall mortality., After AMI, with the progression of left ventricular remodeling and myocardial fibrosis, as well as the formation of cardiac scars, the alteration of electrophysiological properties of myocardial cells in the infarct area and its surrounding areas would result in the local conduction by slowing or blocking, prolonged refractory period, and the increased degree of inconsistent repolarization. Thus, the substrate generating the reentrant of ventricular arrhythmias was formed. The risk of SCD was caused by malignant ventricular arrhythmias could also be increased. ICD therapy was the most effective method to prevent the malignant ventricular arrhythmia. About 1 year after AMI, SCD caused by arrhythmia may account for half of the cases with sudden death and would reach up to 60% after 30 months. Thus, in the early stages after AMI and for the prevention of SCD, it was important to concentrate on revascularization, prevention and treatment of the progress of myocardial ischemia, and refraction, as well as mechanical complications, control of heart failure, and improvement of left ventricular function. While in the long-term management of AMI patients, ICD therapy can effectively decrease the mortality of the patients whose LVEF ≤35% after AMI in 2 years, which was very important for high-risk SCD patients, based on the revascularization and the secondary prevention therapy of the guidelines. Except β-blockers, other antiarrhythmic drugs should not be used to prevent the occurrence of ventricular arrhythmias (recommendation of Class III, evidence of level B). The prognosis of the SCA or malignant arrhythmia that occurred 48 h after the onset of AMI was different from those that occurred within 48 h, which was common in patients with severe heart failure and cardiogenic shock. After revascularization, underoptimal medical treatment of secondary prevention, most SCA, or sustained VTs were not related to ischemia if they occurred from 1 or several months in the course of disease after myocardial infarction. However, there was a high risk of SCD in the future. The SCD prevention was the secondary prevention for the patients. After AMI revascularization, although there was no SCA or sustained VT, the risk of SCD increased if it was combined with severe left heart dysfunction (LVEF ≤35%), unexplained syncope, frequent NSVT, or sustained VT induced by EP study. The SCD prevention was the primary prevention for the patients. Within 40 days after the onset of AMI, sustained VT occurs, which is not related to myocardial ischemia, then comprehensive treatments against ischemia should be performed to correct myocardial ischemia, including revascularization (revascularization should be performed for the second time if the patients have already received revascularization), and ICD should not be implanted (recommendation of Class III, evidence of level C). It is not recommended to use noninvasive (such as microvolt T-wave alternans, autonomic function test, or signal-averaged ECG) for risk stratification at the early-stage post-AMI; (recommendation of Class III, evidence of level B). 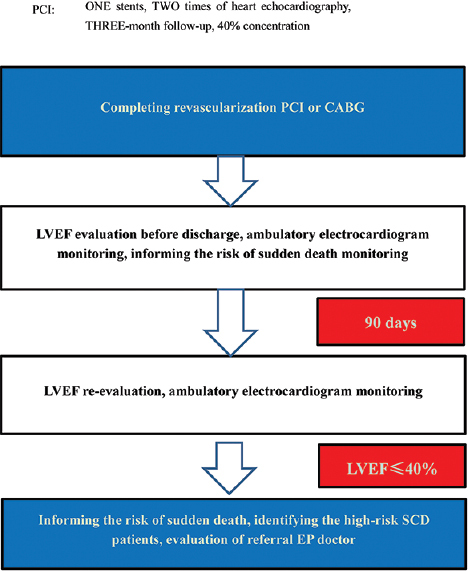 In general, LVEF should be measured within 40 days after myocardial infarction or 90 days after revascularization, cardiac function, and clinical status should be evaluated before deciding whether it was suitable to implant ICD for primary prevention of SCD. The recommendation from the guidelines was based on the negative results of DINAMIT and RIS., But in clinical trials, the evidence generated by the research results and the recommendations of the guidelines did not cover the real and special clinical situations due to the limitations of inclusion and exclusion conditions of selected patients. To address this practical clinical problem, a consensus was published by experts of the three Institutes of America's HRS/ACC/AHA in 2014 which elaborated on how to use ICD to prevent SCD when clinical trials cannot be used or reflected the special circumstances. Due to the lack of clinical evidence, the statements of “is recommended,” “is not recommended,” “can be useful,” and “may be useful” were used in the consensus to express the standpoints of using ICD under different conditions. However, it did not use the common expressions of Class I, Class II, and Class III recommended by the guideline. After 40 days of myocardial infarction and within the 90-day postrevascularization, the implantation of ICD may be useful during the period when the patients are waiting for heart transplantation or waiting for the implantation of artificial heart assist device. Revascularization can reduce ventricular arrhythmias and the risk of SCD for stable coronary disease patients with preserved cardiac function or with mild heart failure. However, for the patients combined with severe left ventricular dysfunction (LVEF ≤35%), SCD still remains the cause of death even if CABG was used to carry out complete revascularization, which accounted for one-third of the overall cardiovascular death, dramatically more than the overall mortality caused by pump failure, myocardial infarction, and cerebrovascular disease. Recently, long-term follow-up studies showed that SCD was the main cause of death for discharged STEMI patients after direct PCI. Therefore, the implantation of ICD should be considered for the patient with high risk of SCD, based on the secondary prevention of the treatment of coronary heart disease after revascularization. Monitoring and prevention of high-risk SCD patients postrevascularization are shown in [Figure 2], [Figure 3], [Figure 4]. For the patients who had ICD implanted, catheter ablation should be used after the first sustained VT (recommendation of Class IIa, evidence of level B). Late stage of severe heart failure (NYHA IV Class) when drug therapy is not effective, at the same time, heart transplantation or CRT-D implantation is not suitable (evidence of level C). Jiyan Chen, Keping Chen, Lin Chen, Yundai Chen, Yansheng Ding, Wei Gao, JunBo Ge, Tao Guo, Yaling Han, Wei Hua, Congxin Huang, Dejia Huang, Lan Huang, Yong Huo, Jie Jiang, Guangping Li, Shumin Li, Bing Liu, Weiliang Liu, Jinghua Liu, Shubin Qiao, Chunguang Qiu, Farong Shen, Xi Su, Baopeng Tang, Yida Tang, Lin Tao, Jian'an Wang, Jingfeng Wang, Shulin Wu, Xiaolin Xue, Lixia Yang, Xinchun Yang, Bo Yu, Zuyi Yuan, Shu Zhang, Yinxin Zhao, Jing Zhou, Shenghua Zhou, Yujie Zhou, Jiangang Zou. Chugh SS, Jui J, Gunson K, Stecker EC, John BT, Thompson B, et al. Current burden of sudden cardiac death: Multiple source surveillance versus retrospective death certificate-based review in a large U.S. community. J Am Coll Cardiol 2004;44:1268-75. Hua W, Zhang LF, Wu YF, Liu XQ, Guo DS, Zhou HL, et al. Incidence of sudden cardiac death in China: Analysis of 4 regional populations. J Am Coll Cardiol 2009;54:1110-8. Mozaffarian D, Benjamin EJ, Go AS, Arnett DK, Blaha MJ, Cushman M, et al. Heart disease and stroke statistics--2015 update: A report from the American Heart Association. Circulation 2015;131:e29-322. Chugh SS, Reinier K, Teodorescu C, Evanado A, Kehr E, Al Samara M, et al. Epidemiology of sudden cardiac death: Clinical and research implications. Prog Cardiovasc Dis 2008;51:213-28. Stecker EC, Reinier K, Marijon E, Narayanan K, Teodorescu C, Uy-Evanado A, et al. Public health burden of sudden cardiac death in the United States. Circ Arrhythm Electrophysiol 2014;7:212-7. Kaul P, Ezekowitz JA, Armstrong PW, Leung BK, Savu A, Welsh RC, et al. Incidence of heart failure and mortality after acute coronary syndromes. Am Heart J 2013;165:379-85.e2. Curtis LH, Whellan DJ, Hammill BG, Hernandez AF, Anstrom KJ, Shea AM, et al. Incidence and prevalence of heart failure in elderly persons, 1994-2003. Arch Intern Med 2008;168:418-24. McMurray JJ, Adamopoulos S, Anker SD, Auricchio A, Böhm M, Dickstein K, et al. ESC guidelines for the diagnosis and treatment of acute and chronic heart failure 2012: The task force for the diagnosis and treatment of acute and chronic heart failure 2012 of the European society of cardiology. Developed in collaboration with the heart failure association (HFA) of the ESC. Eur J Heart Fail 2012;14:803-69. Rea TD, Pearce RM, Raghunathan TE, Lemaitre RN, Sotoodehnia N, Jouven X, et al. Incidence of out-of-hospital cardiac arrest. Am J Cardiol 2004;93:1455-60. Carson P, Wertheimer J, Miller A, O'Connor CM, Pina IL, Selzman C, et al. The STICH trial (Surgical treatment for ischemic heart failure): Mode-of-death results. JACC Heart Fail 2013;1:400-8. Epstein AE, DiMarco JP, Ellenbogen KA, Estes NA 3rd, Freedman RA, Gettes LS, et al. 2012 ACCF/AHA/HRS focused update incorporated into the ACCF/AHA/HRS 2008 guidelines for device-based therapy of cardiac rhythm abnormalities: A report of the American College of Cardiology Foundation/American Heart Association Task Force on Practice Guidelines and the Heart Rhythm Society. J Am Coll Cardiol 2013;61:e6-75. Connolly SJ, Dorian P, Roberts RS, Gent M, Bailin S, Fain ES, et al. Comparison of beta-blockers, amiodarone plus beta-blockers, or sotalol for prevention of shocks from implantable cardioverter defibrillators: The OPTIC study: A randomized trial. JAMA 2006;295:165-71. Connolly SJ, Hallstrom AP, Cappato R, Schron EB, Kuck KH, Zipes DP, et al. Meta-analysis of the implantable cardioverter defibrillator secondary prevention trials. AVID, CASH and CIDS studies. Antiarrhythmics vs. implantable defibrillator study. Cardiac arrest study Hamburg. Canadian implantable defibrillator study. Eur Heart J 2000;21:2071-8. Belevych AE, Terentyev D, Terentyeva R, Ho HT, Gyorke I, Bonilla IM, et al. Shortened ca2+signaling refractoriness underlies cellular arrhythmogenesis in a postinfarction model of sudden cardiac death. Circ Res 2012;110:569-77. Shen MJ, Zipes DP. Role of the autonomic nervous system in modulating cardiac arrhythmias. Circ Res 2014;114:1004-21. Tomaselli GF, Zipes DP. What causes sudden death in heart failure? Circ Res 2004;95:754-63. Liu T, Takimoto E, Dimaano VL, DeMazumder D, Kettlewell S, Smith G, et al. Inhibiting mitochondrial Na+/Ca2+exchange prevents Sudden death in a guinea pig model of heart failure. Circ Res 2014;115:44-54. Canty JM Jr., Suzuki G, Banas MD, Verheyen F, Borgers M, Fallavollita JA, et al. Hibernating myocardium: Chronically adapted to ischemia but vulnerable to Sudden death. Circ Res 2004;94:1142-9. Gerber Y, Jacobsen SJ, Killian JM, Weston SA, Roger VL. Seasonality and daily weather conditions in relation to myocardial infarction and Sudden cardiac death in Olmsted county, Minnesota, 1979 to 2002. J Am Coll Cardiol 2006;48:287-92. Schmidt A, Azevedo CF, Cheng A, Gupta SN, Bluemke DA, Foo TK, et al. Infarct tissue heterogeneity by magnetic resonance imaging identifies enhanced cardiac arrhythmia susceptibility in patients with left ventricular dysfunction. Circulation 2007;115:2006-14. Bigger JT Jr., Fleiss JL, Kleiger R, Miller JP, Rolnitzky LM. The relationships among ventricular arrhythmias, left ventricular dysfunction, and mortality in the 2 years after myocardial infarction. Circulation 1984;69:250-8. Bunch TJ, Hohnloser SH, Gersh BJ. Mechanisms of sudden cardiac death in myocardial infarction survivors: Insights from the randomized trials of implantable cardioverter-defibrillators. Circulation 2007;115:2451-7. Haugaa KH, Grenne BL, Eek CH, Ersbøll M, Valeur N, Svendsen JH, et al. Strain echocardiography improves risk prediction of ventricular arrhythmias after myocardial infarction. JACC Cardiovasc Imaging 2013;6:841-50. Bertini M, Schalij MJ, Bax JJ, Delgado V. Emerging role of multimodality imaging to evaluate patients at risk for sudden cardiac death. Circ Cardiovasc Imaging 2012;5:525-35. Klem I, Weinsaft JW, Bahnson TD, Hegland D, Kim HW, Hayes B, et al. Assessment of myocardial scarring improves risk stratification in patients evaluated for cardiac defibrillator implantation. J Am Coll Cardiol 2012;60:408-20. Kadish AH, Bello D, Finn JP, Bonow RO, Schaechter A, Subacius H, et al. Rationale and design for the defibrillators to reduce risk by magnetic resonance imaging evaluation (DETERMINE) trial. J Cardiovasc Electrophysiol 2009;20:982-7. Gold MR, Ip JH, Costantini O, Poole JE, McNulty S, Mark DB, et al. Role of microvolt T-wave alternans in assessment of arrhythmia vulnerability among patients with heart failure and systolic dysfunction: Primary results from the T-wave alternans sudden cardiac death in heart failure trial substudy. Circulation 2008;118:2022-8. Bauer A, Watanabe MA, Barthel P, Schneider R, Ulm K, Schmidt G, et al. QRS duration and late mortality in unselected post-infarction patients of the revascularization era. Eur Heart J 2006;27:427-33. Chow T, Kereiakes DJ, Onufer J, Woelfel A, Gursoy S, Peterson BJ, et al. Does microvolt T-wave alternans testing predict ventricular tachyarrhythmias in patients with ischemic cardiomyopathy and prophylactic defibrillators? The MASTER (Microvolt T wave alternans testing for risk stratification of post-myocardial infarction patients) trial. J Am Coll Cardiol 2008;52:1607-15. Huikuri HV, Stein PK. Heart rate variability in risk stratification of cardiac patients. Prog Cardiovasc Dis 2013;56:153-9. Goldberger JJ, Cain ME, Hohnloser SH, Kadish AH, Knight BP, Lauer MS, et al. American Heart Association/American College of Cardiology Foundation/Heart Rhythm Society Scientific statement on noninvasive risk stratification techniques for identifying patients at risk for sudden cardiac death. A scientific statement from the American Heart Association council on clinical cardiology committee on electrocardiography and arrhythmias and council on epidemiology and prevention. J Am Coll Cardiol 2008;52:1179-99. Scirica BM, Braunwald E, Belardinelli L, Hedgepeth CM, Spinar J, Wang W, et al. Relationship between nonsustained ventricular tachycardia after non-ST-elevation acute coronary syndrome and sudden cardiac death: Observations from the metabolic efficiency with ranolazine for less ischemia in non-ST-elevation acute coronary syndrome-thrombolysis in myocardial infarction 36 (MERLIN-TIMI 36) randomized controlled trial. Circulation 2010;122:455-62. Buxton AE. Risk stratification for sudden death in patients with coronary artery disease. Heart Rhythm 2009;6:836-47. Russo AM. Risk stratification early post-MI after percutaneous coronary intervention: Should programmed ventricular stimulation be revisited? Heart Rhythm 2011;8:500-2. Buxton AE, Lee KL, Hafley GE, Pires LA, Fisher JD, Gold MR, et al. Limitations of ejection fraction for prediction of sudden death risk in patients with coronary artery disease: Lessons from the MUSTT study. J Am Coll Cardiol 2007;50:1150-7. Moss AJ, Zareba W, Hall WJ, Klein H, Wilber DJ, Cannom DS, et al. Prophylactic implantation of a defibrillator in patients with myocardial infarction and reduced ejection fraction. N Engl J Med 2002;346:877-83. Korngold EC, Januzzi JL Jr., Gantzer ML, Moorthy MV, Cook NR, Albert CM, et al. Amino-terminal pro-B-type natriuretic peptide and high-sensitivity C-reactive protein as predictors of sudden cardiac death among women. Circulation 2009;119:2868-76. Kaikkonen KS, Kortelainen ML, Linna E, Huikuri HV. Family history and the risk of sudden cardiac death as a manifestation of an acute coronary event. Circulation 2006;114:1462-7. Bezzina CR, Lahrouchi N, Priori SG. 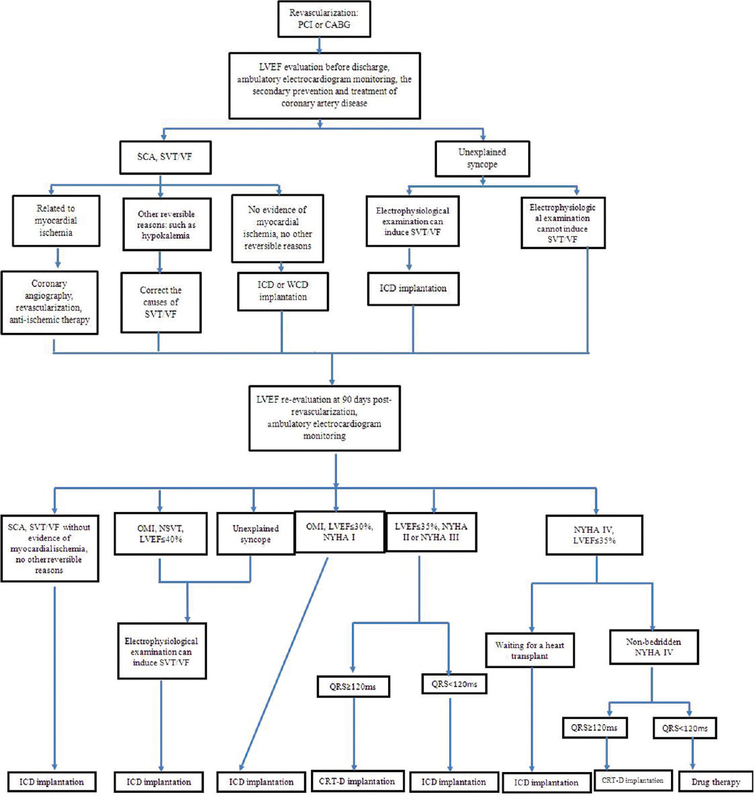 Genetics of sudden cardiac death. Circ Res 2015;116:1919-36. Moss AJ, Hall WJ, Cannom DS, Daubert JP, Higgins SL, Klein H, et al. Improved survival with an implanted defibrillator in patients with coronary disease at high risk for ventricular arrhythmia. Multicenter automatic defibrillator implantation trial investigators. N Engl J Med 1996;335:1933-40. Buxton AE, Lee KL, Fisher JD, Josephson ME, Prystowsky EN, Hafley G, et al. A randomized study of the prevention of sudden death in patients with coronary artery disease. Multicenter unsustained tachycardia trial investigators. N Engl J Med 1999;341:1882-90. Masoudi FA, Ponirakis A, Yeh RW, Maddox TM, Beachy J, Casale PN, et al. Cardiovascular care facts: A report from the national cardiovascular data registry: 2011. J Am Coll Cardiol 2013;62:1931-47. Kuck KH, Hindricks G, Padeletti L, Raatikainen P, Arnar DO. The EHRA White Book 2014: the Current Status of Cardiac Electrophysiology in ESC Member Countries. Biot, France: European Society of Cardiology; 2015. Owens DK, Sanders GD, Harris RA, McDonald KM, Heidenreich PA, Dembitzer AD, et al. Cost-effectiveness of implantable cardioverter defibrillators relative to amiodarone for prevention of sudden cardiac death. Ann Intern Med 1997;126:1-2. Sanders GD, Hlatky MA, Owens DK. Cost-effectiveness of implantable cardioverter-defibrillators. N Engl J Med 2005;353:1471-80. Zhang S, Singh B, Rodriguez DA, Chasnoits AR, Hussin A, Ching CK, et al. Improve the prevention of sudden cardiac arrest in emerging countries: The improve SCA clinical study design. Europace 2015;17:1720-6. Holmes DR Jr., Davis KB, Mock MB, Fisher LD, Gersh BJ, Killip T 3rd, et al. The effect of medical and surgical treatment on subsequent sudden cardiac death in patients with coronary artery disease: A report from the coronary artery surgery study. Circulation 1986;73:1254-63. Natale A, Sra J, Axtell K, Maglio C, Dhala A, Blanck Z, et al. 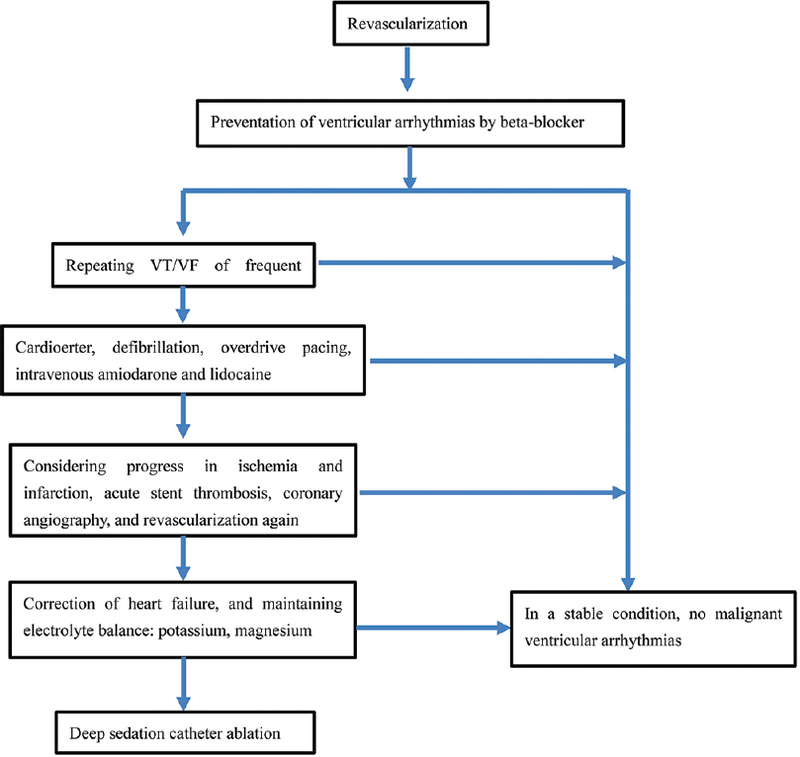 Ventricular fibrillation and polymorphic ventricular tachycardia with critical coronary artery stenosis: Does bypass surgery suffice? J Cardiovasc Electrophysiol 1994;5:988-94. Mehta RH, Starr AZ, Lopes RD, Hochman JS, Widimsky P, Pieper KS, et al. Incidence of and outcomes associated with ventricular tachycardia or fibrillation in patients undergoing primary percutaneous coronary intervention. JAMA 2009;301:1779-89. Mäkikallio TH, Barthel P, Schneider R, Bauer A, Tapanainen JM, Tulppo MP, et al. Frequency of sudden cardiac death among acute myocardial infarction survivors with optimized medical and revascularization therapy. Am J Cardiol 2006;97:480-4. Patton KK. Ejection fraction improvement after primary prevention defibrillator implantation: How much is enough? J Am Coll Cardiol 2015;66:532-4. Funaro S, La Torre G, Madonna M, Galiuto L, Scarà A, Labbadia A, et al. Incidence, determinants, and prognostic value of reverse left ventricular remodelling after primary percutaneous coronary intervention: Results of the acute myocardial infarction contrast imaging (AMICI) multicenter study. Eur Heart J 2009;30:566-75. Ezekowitz JA, Kaul P, Bakal JA, Armstrong PW, Welsh RC, McAlister FA, et al. Declining in-hospital mortality and increasing heart failure incidence in elderly patients with first myocardial infarction. J Am Coll Cardiol 2009;53:13-20. Halkin A, Singh M, Nikolsky E, Grines CL, Tcheng JE, Garcia E, et al. Prediction of mortality after primary percutaneous coronary intervention for acute myocardial infarction: The CADILLAC risk score. J Am Coll Cardiol 2005;45:1397-405. Pedersen F, Butrymovich V, Kelbæk H, Wachtell K, Helqvist S, Kastrup J, et al. Short- and long-term cause of death in patients treated with primary PCI for STEMI. J Am Coll Cardiol 2014;64:2101-8. Marui A, Kimura T, Nishiwaki N, Mitsudo K, Komiya T, Hanyu M, et al. Comparison of five-year outcomes of coronary artery bypass grafting versus percutaneous coronary intervention in patients with left ventricular ejection fractions ≤50% versus >50% (from the CREDO-kyoto PCI/CABG registry cohort-2). Am J Cardiol 2014;114:988-96. Yancy CW, Jessup M, Bozkurt B, Butler J, Casey DE Jr., Drazner MH, et al. 2013 ACCF/AHA guideline for the management of heart failure: A report of the American College of Cardiology Foundation/American Heart Association task force on practice guidelines. J Am Coll Cardiol 2013;62:e147-239. Barsheshet A, Goldenberg I, Moss AJ, Huang DT, Zareba W, McNitt S, et al. Effect of elapsed time from coronary revascularization to implantation of a cardioverter defibrillator on long-term survival in the MADIT-II trial. J Cardiovasc Electrophysiol 2011;22:1237-42. Fox KA, Dabbous OH, Goldberg RJ, Pieper KS, Eagle KA, Van de Werf F, et al. Prediction of risk of death and myocardial infarction in the six months after presentation with acute coronary syndrome: Prospective multinational observational study (GRACE). BMJ 2006;333:1091. Fox KA, Carruthers KF, Dunbar DR, Graham C, Manning JR, De Raedt H, et al. Underestimated and under-recognized: The late consequences of acute coronary syndrome (GRACE UK-Belgian study). Eur Heart J 2010;31:2755-64. Adabag AS, Therneau TM, Gersh BJ, Weston SA, Roger VL. Sudden death after myocardial infarction. JAMA 2008;300:2022-9. Zaman S, Kovoor P. Sudden cardiac death early after myocardial infarction: Pathogenesis, risk stratification, and primary prevention. Circulation 2014;129:2426-35. Solomon SD, Zelenkofske S, McMurray JJ, Finn PV, Velazquez E, Ertl G, et al. Sudden death in patients with myocardial infarction and left ventricular dysfunction, heart failure, or both. N Engl J Med 2005;352:2581-8. Dorian P, Hohnloser SH, Thorpe KE, Roberts RS, Kuck KH, Gent M, et al. Mechanisms underlying the lack of effect of implantable cardioverter-defibrillator therapy on mortality in high-risk patients with recent myocardial infarction: Insights from the defibrillation in acute myocardial infarction trial (DINAMIT). Circulation 2010;122:2645-52. Pouleur AC, Barkoudah E, Uno H, Skali H, Finn PV, Zelenkofske SL, et al. Pathogenesis of sudden unexpected death in a clinical trial of patients with myocardial infarction and left ventricular dysfunction, heart failure, or both. Circulation 2010;122:597-602. Hess PL, Wojdyla DM, Al-Khatib SM, Lokhnygina Y, Wallentin L, Armstrong PW, et al. Sudden cardiac death after non-ST-segment elevation acute coronary syndrome. JAMA Cardiol 2016;1:73-9. Hohnloser SH, Kuck KH, Dorian P, Roberts RS, Hampton JR, Hatala R, et al. Prophylactic use of an implantable cardioverter-defibrillator after acute myocardial infarction. N Engl J Med 2004;351:2481-8. Steinbeck G, Andresen D, Seidl K, Brachmann J, Hoffmann E, Wojciechowski D, et al. Defibrillator implantation early after myocardial infarction. N Engl J Med 2009;361:1427-36. Kusumoto FM, Calkins H, Boehmer J, Buxton AE, Chung MK, Gold MR, et al. HRS/ACC/AHA expert consensus statement on the use of implantable cardioverter-defibrillator therapy in patients who are not included or not well represented in clinical trials. J Am Coll Cardiol 2014;64:1143-77. Pokorney SD, Miller AL, Chen AY, Thomas L, Fonarow GC, de Lemos JA, et al. Implantable cardioverter-defibrillator use among medicare patients with low ejection fraction after acute myocardial infarction. JAMA 2015;313:2433-40. Amsterdam EA, Wenger NK, Brindis RG, Casey DE Jr., Ganiats TG, Holmes DR Jr., et al. 2014 AHA/ACC guideline for the management of patients with non-ST-elevation acute coronary syndromes: A report of the American College of Cardiology/American Heart Association task force on practice guidelines. Circulation 2014;130:e344-426. American College of Emergency Physicians, Society for Cardiovascular Angiography and Interventions, O'Gara PT, Kushner FG, Ascheim DD, Casey DE Jr., et al. 2013 ACCF/AHA guideline for the management of ST-elevation myocardial infarction: A report of the American College of Cardiology Foundation/American Heart Association task force on practice guidelines. J Am Coll Cardiol 2013;61:e78-140. 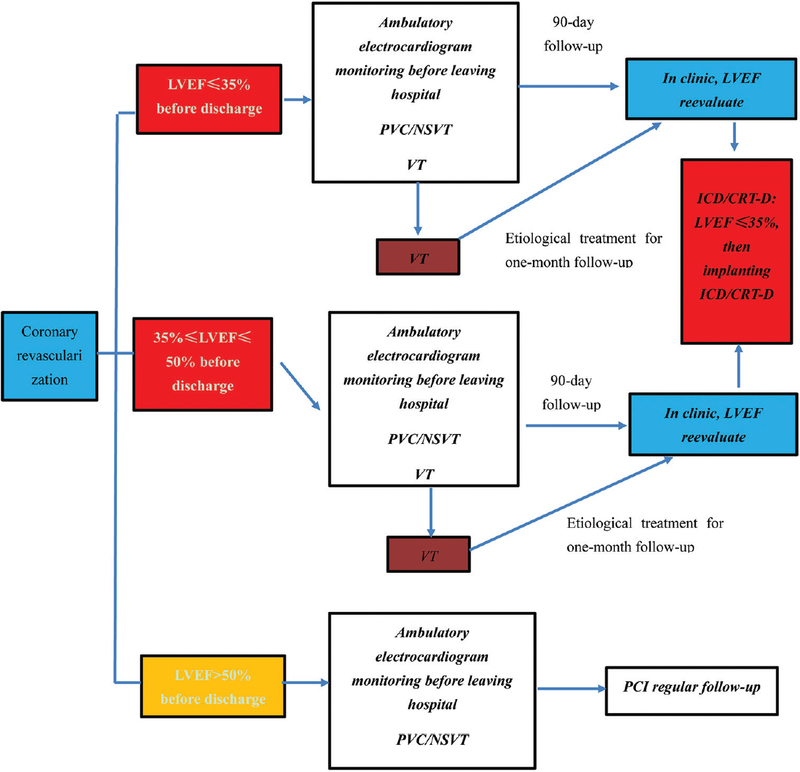 Task Force on the management of ST-segment elevation acute myocardial infarction of the European Society of Cardiology (ESC), Steg PG, James SK, Atar D, Badano LP, Blömstrom-Lundqvist C, et al. ESC guidelines for the management of acute myocardial infarction in patients presenting with ST-segment elevation. Eur Heart J 2012;33:2569-619. McManus DD, Gore J, Yarzebski J, Spencer F, Lessard D, Goldberg RJ, et al. Recent trends in the incidence, treatment, and outcomes of patients with STEMI and NSTEMI. Am J Med 2011;124:40-7. Jernberg T, Johanson P, Held C, Svennblad B, Lindbäck J, Wallentin L, et al. Association between adoption of evidence-based treatment and survival for patients with ST-elevation myocardial infarction. JAMA 2011;305:1677-84. Chinese Medical Association, Chinese Society of Cardiology, Chinese Society of Pacing and Electrophysiology, Chinese Medical Association Association of Heart Rhythm. Chinese expert consensus document on implantable cardioverter defibrillator therapy. Chin J Cardiac Arrhyth 2014;18:242-53. Task Force Members, Montalescot G, Sechtem U, Achenbach S, Andreotti F, Arden C, et al. 2013 ESC guidelines on the management of stable coronary artery disease: The task force on the management of stable coronary artery disease of the European Society of Cardiology. Eur Heart J 2013;34:2949-3003. Bristow MR, Saxon LA, Boehmer J, Krueger S, Kass DA, De Marco T, et al. Cardiac-resynchronization therapy with or without an implantable defibrillator in advanced chronic heart failure. N Engl J Med 2004;350:2140-50. Zhang Y, Guallar E, Blasco-Colmenares E, Butcher B, Norgard S, Nauffal V, et al. Changes in follow-up left ventricular ejection fraction associated with outcomes in primary prevention implantable cardioverter-defibrillator and cardiac resynchronization therapy device recipients. J Am Coll Cardiol 2015;66:524-31. Chatterjee NA, Roka A, Lubitz SA, Gold MR, Daubert C, Linde C, et al. Reduced appropriate implantable cardioverter-defibrillator therapy after cardiac resynchronization therapy-induced left ventricular function recovery: A meta-analysis and systematic review. Eur Heart J 2015;36:2780-9. Goldenberg I, Kutyifa V, Klein HU, Cannom DS, Brown MW, Dan A, et al. Survival with cardiac-resynchronization therapy in mild heart failure. N Engl J Med 2014;370:1694-701. Cleland JG, Daubert JC, Erdmann E, Freemantle N, Gras D, Kappenberger L, et al. Longer-term effects of cardiac resynchronization therapy on mortality in heart failure [the CArdiac REsynchronization-heart failure (CARE-HF) trial extension phase]. Eur Heart J 2006;27:1928-32. Gorcsan J 3rd, Schwartzman D. Ventricular arrhythmias after cardiac resynchronization therapy: Does reverse remodelling reverse risk? Eur Heart J 2015;36:2790-1.